This project was designed by the client and the attention to detail in the scope of works was extremely evident. The home was built during the mid 90’s and the client felt that the home was limited, required a facelift and the addition of extra living spaces. The client’s criteria were met and a modern, open, solar passive and spacious home created. The works included extending the living room which involved lifting the ceiling height from 2.7 metres to over 4 metres, double glazed alfresco stacking doors and automated opening highlight windows were installed resulting in a solar passive, open and light filled living area. The height of the roof line continued outside to create a striking covered alfresco area perfect for entertaining. The existing loft was an ineffective space accessed by a small spiral staircase, the floor area of the loft was extended and highlight windows were installed to capture the northerly aspect and views to create a bright and spacious office space. The office is linked to the new living area down a beautiful hardwood staircase. The existing kitchen was removed and new joinery and a walk in pantry was installed creating a contemporary and appealing kitchen using a clever combination of materials including stone, glass, mini orb and timber. 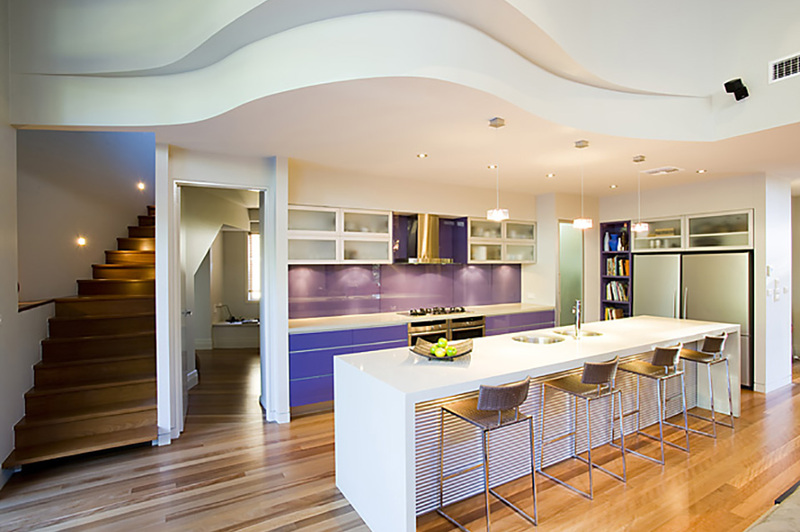 The kitchen is set below the stunning two tiered curved bulkhead that is a fabulous feature of the open living area. The ensuite bathroom was also remodelled to create a more open and modern bathroom. New brush box timber flooring was laid throughout the living areas to tie in with the existing, an insulated wine cellar was also created at the rear of the kitchen and concealed behind closed doors, a steel pergola was constructed at the front entrance together with a new aluminium feature door and new fitted windows were installed into the lounge room. Our team together with the clients experienced a great deal of satisfaction with the end result of this stunning extension and remodelled Gleneagles home. The extreme complexities were overcome, the construction processes together with the products used were environmentally friendly and energy efficient and a ‘wow’ factor was certainly achieved.